It’s finally here — our first retreat! Y’all, we are so excited about this event. Let’s get right to the details. Imagine a weekend where you can knit or crochet to your heart’s content, surrounded by others who also love the craft. The inaugural StitchEscape is just that… a chance to make some new friends, get away for a bit, and immerse yourself in yarny pursuits. We have such a fun weekend planned and hope that you will join us! Event attendees will enjoy fun workshops and demonstrations, a marketplace, make-and-take opportunities, show-and-tell, movie night, stitchers’ yoga, door prizes, plenty of knitting time, awesome swag, and more. Friday dinner and cash bar, Saturday lunch, dinner and cash bar, and Sunday brunch are included with ticket price. Tickets for the StitchEscape can be purchased in-person at the studio, over the phone with credit card (614-670-5629), or on our website. 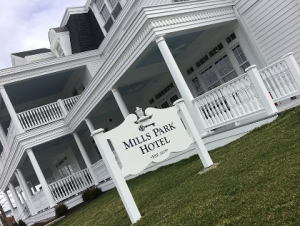 Once you’re in, you’ll arrange lodging directly with the Mills Park Hotel (and your roommates if you’d like!) or other nearby hotel of your choice. Limited spots are available, so purchase your ticket soon!